This is a year-round program that is offered in monthly sessions. New students are always welcome and may sign up at any time. No previous experience is required to join. 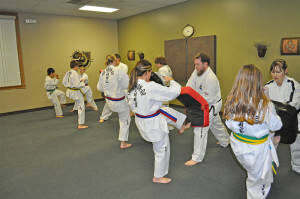 This program is affiliated with the US-ITF (International Taekwondo Federation) and is held every Tuesday and Thursday. You may register to attend once a week or twice a week. Family discounts are available for immediate family only. If you would like to observe this program before registering, please contact our Recreation Supervisor, Adi Powell, at 636.949.3579. *Payment due at the beginning of each month, no exception. *Uniforms are not required until the student is testing for their first belt. Uniforms range in sizes 000-7 depending on height and weight. They can be purchased through our Administration Office. *A student manual is preferred by our instructors but not mandatory and can also be purchased through our Administration Office.